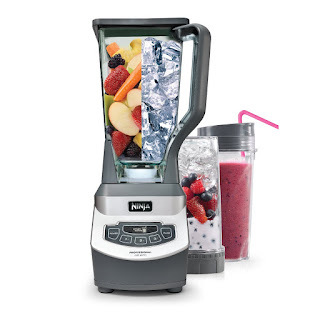 Head over to get this Ninja Professional Blender with Nutri Ninja Cups for ONLY $62.99 Shipped (Retail $119)! The Ninja Professional Blender and Nutri Ninja Cups is a professional, high-powered kitchen tool with 1100 watts of power. Its XL 72 oz. Blender Pitcher (64 oz. max liquid capacity) features Total Crushing blades that blast through ice and frozen fruit in seconds for perfect ice crushing, blending, and controlled processing. Plus, its 16 oz. Nutri Ninja Cups with To-Go Lids make it easy to take delicious, nutrient-rich juices on the go. All parts are BPA free and dishwasher safe. Removal of the cup: Wipe the exterior of the cup clean. Holding the cup away from your body, carefully twist the Blade Assembly counter-clockwise to remove. If necessary, use a dish-towel or rubber gripper to get a better grip. Do not hit the cup or try to pry open as this may damage the cup or blade assembly.